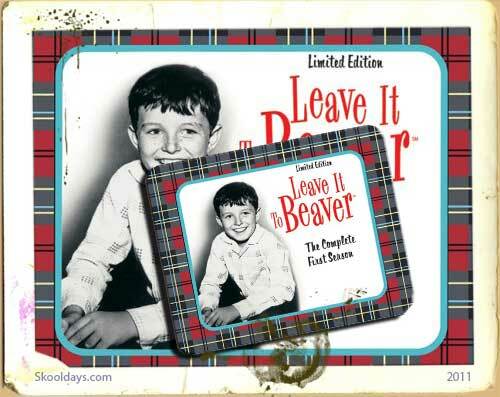 It seems that the 1957 Leave it to Beaver is the latest craze to grip parents and children. This great sitcom ran through the 1950s and 60s. It was about an inquisitive but often naïve boy named Theodore “Beaver” Cleaver and the adventures and pickles he would get into around the neighbourhood. Its estimated there were around 234 episodes made. Recently we were asked is it possible to get a Leave it to Beaver Lunchbox? Alice Gowin a Skooldays.com fan asked us “Could you please help me find a “Leave it to Beaver” lunchbox – I would really like to buy one. Thank you for your time and patience.” Well whats really cool is the answer is yes, and you can get it for free! The First season is considered one of the best, with episodes including “The Black Eye”, “The Bank Account”, “Train Trip”, “The Perfect Father”, “Beaver Runs Away”, “Tenting Tonight”, and “The Haircut”, which has Beaver getting scalped by barber Wally. Also “Beaver’s Short Pants”, “Party Invitation”, are included in the Lunchbox. Many will still remember the school slang used in the sitcom. Wally and Beaver both use “gyp”, “mess around”, and “hunka”, “Junk”, “crummy”, “grubby”, “rat”, and “creep”. Does anyone out there still use any of these slang words? This entry was posted in LunchBox, PrimeTime and tagged 1970 by Skooldays. Bookmark the permalink. Toy Story Pull String Woody. Talking Figure Disney Exclusive.